Sometimes it’s easy to forget why you loved football in the first place. It feels like there are a million and one blogs on the internet charting the author’s growing disillusionment with modern football, so I won’t bore you with another one here. Suffice to say that as someone who had been a Cardiff City season ticket holder for 16 years but has stopped going to matches since the Bluebird made way for the Red Dragon, the football season so far had seen me strangely detached from it all – still watching, still enjoying, but not quite feeling the passion I always had. The last match I’d been to was Cardiff v Wolves, a match I had left at half-time, unable to come to terms with seeing the home side in red. Enter Wigan. I appreciate that statement may need some explanation so here’s the context: my brother – for reasons best known to himself and a classic edition of ‘Championship Manager’ – is a big Wigan fan (as well as supporting Cardiff – he’s not as bothered by the kit change as me). This isn’t an idle or short-term curiosity either; he’s been a fan of them since before they were in the Premier League and his support and interest have been unwavering. This is why we’ve made a tradition of making the pilgrimage (for him anyway) to the DW once a year around his birthday. However, my move back to Cardiff from Liverpool made a trip to Wigan rather more difficult than previously but the fixture list kindly obliged by giving the Latics an away trip to Swansea at the perfect time. It seemed appropriate that the results of the BBC survey into ‘The Price of Football’ were revealed in the week preceding the match, as I paid £52.50 for the two tickets (£35 for an adult and £17.500 for a student). Taking food, train tickets and the like into account and the total cost was probably around £80. That seemed to me a hell of an outlay when you may have to watch Alan Tate, but it was pointed out to me on twitter that this probably represented pretty good value for two Premier League tickets – and the worrying thing is that at the moment this is probably true. For those who haven’t been to the Liberty Stadium, if you’ve been to the Cardiff City Stadium, the KC in Hull or the Madejski in Reading, you don’t really need to bother. Stadium on the outskirts of town? Check. Neighboured by a large, soulless and national/global brand-dominated industrial park? Check. A stadium with a faintly dull exterior, rounded off into a bowl and with that “straight out of the box and make sure we stick the correct badge on the front” feel? Check. These are not necessarily criticisms of course – the ground was sleek, comfortable, safe and had a perfect playing surface, I just personally find the soullessness and lack of identity to these newer stadiums a tad depressing, despite appreciating their virtues and the fact that grounds described as having “character” is often short-hand for “absolute dump”. So, to the match itself. Actually, no, first I just need to pass comment on the wonderfully insular nature of Wigan substitute David Jones’ warm up routine. He must have spent a full 20 minutes of the half hour on his own, slowing dribbling backwards and forwards in a 10 yard line, pulling off little tricks and Cruyff turns. He then half heartedly joined in a “piggy-in-the-middle” type keep-ball drill with the other substitutes for about 5 minutes (they’d been doing it for 10 minutes already) then had the goalkeeping coach tee him up for volleys from the edge of the area when everyone else apart from Jordi Gomez had returned inside for the team-talk. Gloriously self-indulgent. With this cameo done, the teams took to the pitch with neither group of players having worn the Kick It Out t-shirts: apparently numerous Swansea players did not want to wear them so their teammates did likewise in solidarity while Wigan, hearing of this, chose to do the same in support of the home side. Swansea lined up in a formation somewhere between 4-2-3-1 and 4-3-3, while Wigan used their now usual, somewhat asymmetrical 3-4-3 that served them so well towards the end of last season. So with Hymns and Arias sung (and a recording of it being sung played over the PA – I’d always thought it sounded loud on TV) the game was underway. Unsurprisingly, due to their indifferent run of recent form, the feeling around both the home team and fans was that nothing less than a win was required and they started purposefully, attempting to dominate possession as they so often do. However, Wigan were prepared for this, and in the early stages kept the ball quite competently themselves, though soon Swansea took a firm grip on the game. Ki Sung-Yeung was neat and tidy in midfield while the main attacking threats came from Wayne Routledge on the left and Michu’s clever movement up front. As someone who has watched Swansea fairly often both pre and post-promotion, I thought that this year’s incarnation seem a slightly different beast to Brendan Rodgers’ side. There seemed to be a little less focus on possession for possession’s sake, so the ball was kept and passed around the backline less often then when I have previously seen them, with more attention paid to getting the ball wide to the wingers as early as possible – while keeping it on the floor, of course. Though this made them more conventionally attacking, they looked less incisive going forward than they have previously: rather than wait for the right opportunity to strike, the plan appeared to be to get the ball wide and…erm…hope something happened. In fairness to the Swans, Wigan’s unusual formation is one opponents often take a bit of time to work out, and despite all their possession, their main chances (a header and volley both put over by Michu) came from Wigan mistakes rather than the home team’s creativity. 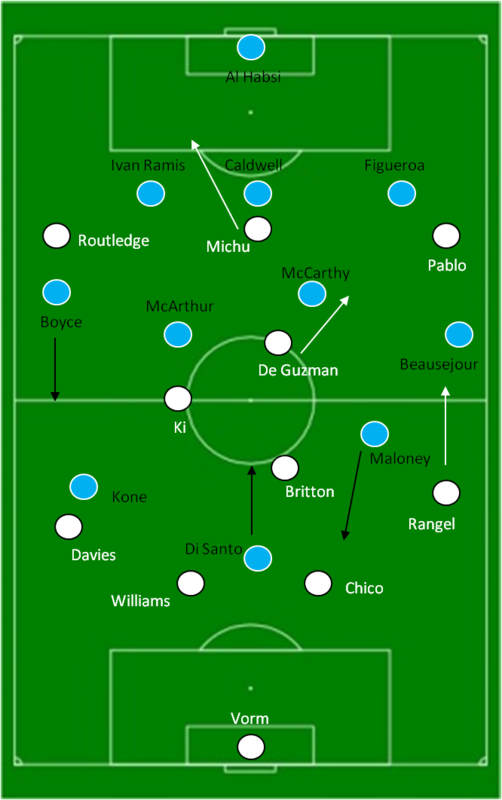 From Wigan’s perspective, their set-up seemed quite well suited to an away performance: they were able to defend in numbers – with Caldwell and Ramis excellent – while conceding territory and possession. In fact on the break Wigan created the best opportunities: a stretching Maloney only able to direct a shot that was comfortable for Vorm and then just before half-time the Scot brilliantly released Beausejour down the left, who shot off target when presented with the half’s best chance. One of the most entertaining aspects of the half was the fact that the two worst players on the pitch were facing off against each other. A number of Swansea breaks and opportunities came from Figueroa giving the ball away cheaply, and the only reason the Honduran was not exposed was that he was confronted with Pablo, the ex-Valencia man exhibiting the kind of form that presumably convinced the Spanish club to sell him in the first place. Probably the highlight of the half for the more childish sections of the crowd (of which I am a proud member), was James McCarthy rushing towards the touchline to intercept an attack and promptly punting the ball directly into a middle-aged woman’s face from less than 10 metres away (just so you don’t think I’m utterly horrible – she was fine). As that anecdote may have suggested; the first half wasn’t really a classic. The second period quickly settled into the same pattern – Swansea got in behind a few times in the opening minutes as Wigan started sluggishly, but once they’d woken up the visitors looked fairly comfortable again. So it came as a bit of a surprise when Swansea took the lead in the 65th minute. A ball was played by Vorm to the left hand side and as Boyce ran forward to close the full-back down, my brother shouted “he’s pushed too high, don’t go that far!”. Sure enough, the ball was played into the space vacated by the Wigan wing-back, pulling the other defenders across, eventually leading to Pablo having just enough space to reverse a shot into the bottom left corner from the edge of the area, wrong-footing Al Habsi. It was his only positive contribution to the game, but to be fair, if you’re only going to do one thing, scoring is quite a good option to pick. With their dominance of both possession and territory, it was hard to argue Swansea’s lead was unjust, but nevertheless it came somewhat out of the blue as Wigan had looked fairly comfortable to that point. The Swansea fans barely had time to finish celebrating before Michu made it 2-0, taking advantage of poor Wigan defending to score from what felt like Swansea’s 49th corner of the match (the previous 48 had been dealt with without any real problems). As the home fans celebrated once more, my first thoughts were that that would be that – Swansea would be happy to play keep ball from here on out and Wigan may struggle to get a kick between the restart and the end of the game. Further proving how much I know about football, Wigan fought back immediately, with a few half cleared crosses ending with a frankly ridiculous backheeled volley by Emerson Boyce looping into the net and bringing Wigan back into the match. In fact, so outlandish was the goal and due to my slightly obstructed view of it, I initially tweeted describing it as a “scrappy goal”, before turning to my brother about 5 minutes later and asking “hang on, did he just backheel that in?!”. In the 64th minute the game had been 0-0 and frankly looked like drifting to finish that way, in the 70th minute it was 2-1 and Wigan were suddenly dominant. The BBC report on this game has possession at 53%-47% in Swansea’s favour. If there was a breakdown of this, I’d expect up to Wigan’s goal it would show Swansea had about 70% of the ball, but in the last 20 minutes I’d be surprised if they managed 20%, largely thanks to a wonderfully un-British substitution from Roberto Martinez. Initially, at 2-0 down, he readied Ryo Myachi and Jordi Gomez. However, Boyce’s moment of genius came with them waiting on the sideline and the manager changed his mind, instead sending on Ben Watson for Figueroa, to much bemusement. Watson became the base of a diamond in midfield, with Beausejour and Boyce becoming conventional full backs in a four-man defence, McCarthy and McArthur dominating the middle of midfield and Maloney adopting a false 9 position (sorry for dropping that one in, but he did) with Kone and Di Santo attacking from wide positions. Suddenly the home team were swamped, and the tension amongst players and fans desperately needing a win became clear. The Swans dropped deeper and deeper, and Wigan pressed forward. Maloney was superb, linking excellent with his midfield and finding pockets of space in front of Swansea’s back four. McArthur also regularly found himself in great positions but seemed unable to work out what to do once there. For all their dominance, Wigan struggled to create chances, largely due to Di Santo’s poor performance, scuffing one opportunity that fell to him on the edge of the area. There was one chance though. A very good one. So good that Kone couldn’t miss. Beausejour lasered a cross in from the left and Kone, unmarked, powered a header home from inside the 6 yard box. Cue delirium in the away end. Cue a linesman’s flag. Cue amusement and relief in the home crowd. Replays showed that Kone was probably level and that the call was a very harsh one on the visitors. In the aftermath, both managers stated the decision was probably the wrong one, and pundits agreed – though obviously being Swansea-Wigan, nobody appeared to care that much. Imagine for a moment it had been one of the Manchester teams involved. The “scandal” of that decision would have been picked over and discussed for days, been brought up regularly when discussing the minute details involved in deciding the title race. Wigan are, as usual, one of the contenders for relegation this season, arguably far more important in many ways to a club than whether or not they finish 1st or 2nd and yet I imagine outrage on their behalf will not be particularly prevalent. Of course, this is merely an example of the sort of decisions that regularly go against smaller teams without much notice being taken, while one such incident involving a ‘big’ club causes a media meltdown. Anyway, from there on in Wigan, despite their dominance, struggled to create chances and it was Swansea who should have sealed it; with Michu and substitutes Dyer and Graham all spurning good chances to score the home team’s third. 4 minutes of injury time concluded with Ali Al Habsi’s header (yep) being saved easily by Vorm and the whistle went, bringing with it an explosion of relief from the home fans and team, sensing this was an important win as much because throwing away a 2-0 lead may have shattered already brittle confidence. Overall, it wasn’t a brilliant game – it had 10 rather mental minutes inside another 80 where not a lot happened, but I thoroughly enjoyed it. Two teams attempting to play good football and at times succeeding made for a contest that was pleasing on the eye and occasionally thrilling, and while the atmosphere wasn’t great the tension towards the end was everything you enjoy (and hate) about going to a football match – the joy of seeing your team score, the fury with officials, the frustration at missed chances and overall the sheer tension, not forgetting the wonderful lunacy that seeing a ‘keeper up for a corner always provides. As I’m hardly a die-hard Wigan fan and wasn’t facing a 4 or 5 hour journey home my mood may not be entirely representative of all those in the away end, but I left remembering exactly why I’ve always loved watching football so much. 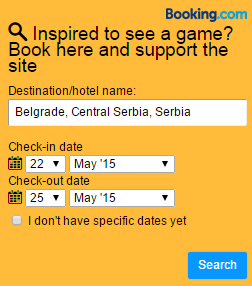 Posted on October 24, 2012, in Guest Post, Match Reports. Bookmark the permalink. Leave a comment.